On Sunday March 26th, the Sydney Society of Model Engineers Inc. began their year-long celebration of 100 years of operation, making S.S.M.E. the oldest continuous modelling facility in the southern hemisphere. While reference to an early society of model engineers may be found in 1900, it is unknown what became of that fledgling society and its forty members. This society dates its beginnings to 1906 when the Summer Hill Society of Model Engineers formed, meeting in the home of the Purnell family at Summer Hill. On alternate meetings nights, members watched demonstrations or conducted tests in Mr Purnell's workshop. As membership grew beyond the capacity of a home workshop, the Society moved its meetings to the Carton Hall in Summer Hill and began public exhibitions, the first being held in the Summer Hill Masonic Hall in 1912. An electric railway, a twin cylinder marine engine, 1/2" scale locos and several launches splashing in the water tank entertained the crowd which was so large on the second night that some had to be turned away. The success of the first Exhibition led the members to change their name to the "Sydney" society, in case another group should be established and claim this more prestigious title. W J "Belvedere" Smith arrived from England in 1913. Already a well-known modeller and frustrated by the difficulty in obtaining supplies from England, he eventually turned from his mechanical training to establish a screw manufacturing business in Hurstville. Recovery from falling membership during the First World War, the Society continued its public exhibitions, moving from the Summer Hill Masonic Hall to Sydney Town Hall and then to Marrickville Town Hall. In 1924, Cec Mackellar joined S.S.M.E. and was a driving force for the next twenty five years of its history. Still without their own facilities, both boats and trains were operated in Moore Park and regular visits to member's homes and workshops were arranged. At the 1925 Exhibition in the Sydney Town Hall, Mr Watson reached 20 mph with his hydroplane in the 45ft water tank and a large display of model planes was provided, including one of the Vickers Vimy, the plane in which Sir Charles Kingsford Smith had flown from England to Australia. In 1926, Mr Needham was allowed to demonstrate his power boat in the pond in Centennial Park after he had convinced the Park Superintendent that it would not disturb the wild fowl. Two years later, Mr Needham reported the sinking of his model steam boat off Pretty Beach when a shark took it in its jaws, causing the female passenger of the rowing boat to faint. Some seven months later, the remains of the model were retrieved by a fishing party with the boiler and lamp in good repair. Albyn A. Stewart was appointed as the first Patron of the Society from 1927-1936. A keen boat modeller, Mr Stewart served on the Board of the Technological Museum of Sydney. Today, over 250 models of his collection are held by the Powerhouse Museum. Members were often welcomed at Mr Stewart's home at Wentworth Falls. By the end of the twenties, it was apparent that some permanent facility was needed. Secretary Fred Steward identified a piece of ground at 190 Parramatta Road, Ashfield just behind his home. £5 a year rent was required. Work began apace to build facilities for boats and trains and the site opened to the public in January 1933. Aub Lofts circled the track with all locos and carriages coupled behind and Mr Mathew's "Ninevah" made the first circuit of the boat pond. So successful was the opening that a decision was made to purchase the rented land. A price of £95 was negotiated by Cec Mackellar and Patron W J Smith donated £50 towards the purchase. The Ashfield facility, known as Exhibition Park, was now open to the public each Saturday afternoon with a charge of 6d for adults and 3d for children. Just 12 months after the 1933 opening, Mr J. Fielding, a prominent businessman who owned a package manufacturing business near Broadway, opened the duplication of the rail track, now 1000 feet in length, in view of a crowd of 400 Sydneysiders. On September 14, 1935, His Excellency, Brigadier General Sir Alexander Hore-Ruthven, Governor of NSW, opened the Clubhouse with some 2000 visitors attending and inspecting the facility. The two-storey building included a meeting hall, workshop, office and bathroom. Outside were 2 ponds, 2-1/2" gauge rail track mounted on 4000 sleepers, and a boiler servicing up to 12 stationary steam models at any one time. The Society's ownership of such a facility was admired around the modelling world. Shortly after the 1935 opening, Ron Cowan's "Whirlwind" set a world record for 1 metre flash steam boats. 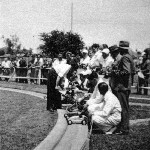 Over Easter, 1937, the Australasian Speedboat Championships were held at Exhibition Park and Cowan's "Sunbeam" again achieved record speeds of 53.11mph over 575 yards. This feat was acknowledged world wide. By 1940, Frank Cooper, a boat enthusiast, drew attention to the popularity of tether car racing in the UK. In November 1940 Frank ran the first tether car at Ashfield, achieving a speed of 55mph, a far cry from today's world record speed of over 338kph. Soon World War II was engaging the services of members. Absent members were exempted from dues and gate takings were and collected for the London Bomb victims, these monies being forwarded through the office of The Model Engineer in London. The first SSME Bulletin was produced in 1945 with Nelson Johns as Editor. In 1947, S.S.M.E. acquired a Boomerang long-wing, single seater plane that had seen service in the Pacific for display in the grounds. However, as it blocked access to neighbouring properties, the plane had to be dismantled and removed. Aluminium from this plane was melted down by Fred Steward and made into HO castings and two hydraulic turntables that form part of the elevated hydraulic turntable at Model Park today. The fifties was a period of expansion for the Society. A new tether car track was built in 1949, the original boat circle being filled in for this purpose. In 1950, S.S.M.E. was recognised as the official governing body for model boating in Australia. Now the loco track could accommodate four gauges, there was a well-established powerhouse for stationary models and the "0" gauge electric track operated in the clubhouse. Radio control technology made its first appearance at Ashfield, a radio control boat being operated in the pond in 1952. Edna Wells became the first female member in 1954. So auspicious was this occasion that she received a gold plate badge and a bunch of carnations from President Jack Mann. At the 1955 Anniversary celebration, seaplanes were flown over the pond. Crowds flocked to Exhibition Park during the fifties and sixties, children enjoying a train ride on "Betsy" driven by Gordon Twiner. The Society continued to develop facilities for new modelling interests and the first slot car championship was held in the Clubhouse in 1961. This hobby attracted many young men from surrounding suburbs. However, rising Council rates and neighbour dissatisfaction with noise levels led Secretary Jack Harvey to urge the Board to relocate to larger premises. It was to take in a decade of lobbying, persistence and hard work before the sale of the Ashfield site and the purchase of the current property at Luddenham. Twenty five acres, $27,000, and the process of "making it anew" began again. Led by President Lloyd Grono and Keith Mears, a small band of volunteers laboured for just over a year to achieve the opening of Model Park on October 10th, 1971. The new facility provided spaces for tether cars, boats, slot cars, HO gauge railway, stationary steam, ground level and elevated rail track and radio-control flying. Soon, the first radio-control car track would be added and subsequently a space allocated for control line fliers. The newest facility is the garden railway developed in an impressive setting within the main loco track system. In the thirty five years of operation at Model Park, S.S.M.E. has hosted the Australian Association of Live Steam Convention in 1981, and again hosted the 50th A.A.L.S. Convention at Easter this year; the World Model Race Car championships in 1986 and again in 1998, and a variety of national events. Members of the Society travel to international events and welcome international competitors to share their facilities. The technologies of today have changed dramatically compared to those at the turn of the century. Radio control, computer timing devices and use of new fibre technologies all present ongoing challenges to the model engineer. «« Wayne Dand's "Space Walker"
Lawrence of Arabia once said "Being a mechanic cuts one off from all real communication with women - No woman, I believe can understand a mechanic's happiness in preserving his bits and pieces". No history of the Society would be complete without recognition of the women behind the scenes. In 1937, a Ladies Committee was formed whose intention was to organise social functions and raise monies for charity. Throughout the years at Exhibition Park, Ashfield, the ladies raised funds from sales of afternoon teas to the public and social functions. These were used not only for the benefit of the members but also for a range of charities. Today, many kindred societies remain envious of the fact that the Society owns its own "Park" that is open to member use for 365 days of the year and opens to the public on the last Sunday of each month except December. "Joy in the Making: 100 Years of the Society of Model Engineers", a history of the Society has been produced to mark the centenary and the Society's historian, Dr Lyn Peacock, would welcome inquiries about this publication and the memories of former members and visitors to S.S.M.E. Some scenes of members with cars and boats at Ashfield. at SSME's 100th birthday celebrations. This article was first published in Australian Model Engineering magazine in Issue 127 Jul-Aug 2006, from material supplied by the SSME. It is published here with permission. Photos from SSME unless stated. Text and photos are Copyright © SSME and AME, and may not be used without permission. 57 Text and photos Copyright © 2006-2019 SMEX, All rights reserved.